An examination of the causes, effects, and options available to mitigate natural disasters, such as earthquakes, volcanic eruptions, tsunami, landslides, subsidence, flooding, severe weather, and meteorite impacts. Follow the links below to material related to this course. New links will be added and updated throughout the semester, so check back with this page often. After exams, I post here in the announcement section some of the issues I found while grading the exams. These comments may be helpful and you can find these old announcements from previous semesters by clicking HERE. Because of the freeze day last week, I have had to revise the syllabus. The links above will now take you to the revised version of the Syllabus. Note that assignment due dates and the midterm exam date have changed. I have finished grading the midterm exam and I will pass it back in class today. To see the distribution of scores and comments on the exam click HERE. Final exams have been graded and scores have been posted to Canvas (look under assignments). Grades have been posted to Gibson. If you want to see your final exam or have any questions about your scores or grades, please feel free to come by my office, Room 208 Blessey Hall, or you can send e-mail. It is probably best to make an appointment, as I am in and out of my office now that the semester is over. What truly is amazing is that many of the comments below are the same comments I posted after the previous semester's final exam and have been posted on this web site during the entire semester. One good thing - Everyone in the class now knows that magmas do not come from the liquid outer core of the Earth. So, I can now retire. Two primary goals that I have in this course are to provide information that will help save your lives and to bust myths people have about historic events or the way things operate. The bad thing about final exams are that they are final - people don't know what they did wrong, and thus walk away believing things that are just not true. 6 people still think that the levee breaches that occurred in New Orleans during the Katrina event all happened the day after Katrina made landfall. This is absolutely false. 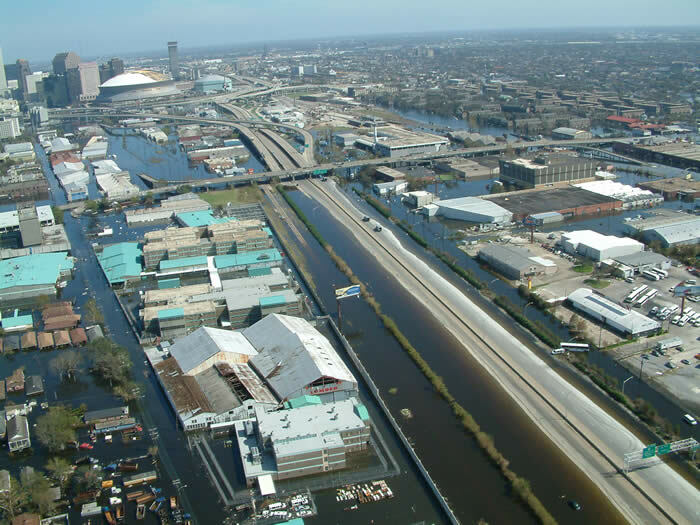 All levee breaches occurred on the same day that Katrina made landfall (August 29, 2005). I am still puzzling over how I can get this myth out of people's heads. 5 people still think that New Orleans flooded because the Mississippi River Levees failed. All levees that failed in New Orleans were on human made navigation and drainage canals. Many of you still think that the amount of damage that an earthquake causes depends on the time of day. The amount of casualties certainly does, but the damage will be the same no matter when the earthquake occurs. Although large earthquakes in China and floods in Bangladesh usually result in a large number of casualties, an impact with a large space object (> 1 km) could potentially kill everyone, and thus is the worst possible disaster we discussed in the course. 7 people think that the eruption of cinder cone in a large city would be the worst possible volcanic disaster. Cinder cones are small. What about eruptions from volcanoes like Yellowstone or Long Valley? New Orleans does not have anywhere near a 40% chance of getting hit by a Category 5 hurricane in any given year. Yes, it has a 40% chance of getting hit by a tropical storm or hurricane, but CAT 5 storms are very rare. The best evidence that global warming is occurring is that average global temperatures have increased over the last 150 years. The evidence does not come from metling ice or the amount of Carbon Dioxide in the atmosphere. The evidence comes from measuring temperatures and this evidence cannot be disputed. 6 people still thing that we have a way to predict earthquakes before they occur. This point was emphasized many times in class, in homework, and on the mideterm. 8 class members need to go back to kindergarten and relearn the alphabet. The letter I, as in Isaac, is not the 5th letter of the alphabet, it is the 9th, and thus Isaac was the 9th tropical storm or hurricane of 2012. Several questions on the final exam were designed to see if you learned some valuable life or death lessons. The results are discouraging. 7 people died from the plinian volcanic eruption because they failed to realize that the most dangerous aspect of such an eruption is pyroclastic flows not the falling ash. 2 people died when the second wave of the tsunami hit because they thought that tsunami came in single waves. Only 1 person (still too many) died from the tsunami by calling the coast guard to ask for a helicopeter rescue them off the California beach. Unfortunately, the tsunami arrived and washed them out to sea before the helicopter arrived, much to the horror of the rest of class who had climbed to the top of the hill to safely get away from the tsunami. 9 people died (nearly half the class) from the Category 4 Hurricane as their beach house, where they went for refuge, was destroyed by the storm surge from the hurricane. The rest of the class evacuated away from the coast and survived. 1 death resulted from opening windows in the house during a hurricane under the false assumption that it would relieve pressure, but instead resulted in furniture crashing into their heads. 2 of you died from getting struck by lighting by running out in an open field to protect yourself from lightning. 3 people died in a tropical cyclone (hurricane, typhoon, or cyclone) because they thought that the wind was the most deadly aspect of such storms and failed to consider the storm surge. 3 people died from the flash flood in the desert because they mistakenly thought that flash floods don't occur in the desert. That's 28 deaths in a course in which you were supposed to learn how of avoid deaths by natural disasters. Some people died more than once, but I did not keep track of those statistics. Hopefully those of you who potentially died in these situations will read about your errors here before reality strikes. Congratulations to those of you who are graduating, and best wishes for a great summer to all. Note: Two versions of each set of lecture notes are shown in the table below. The first is in html format, optimized for viewing on the Web. You can print this version directly from your Web browser, but there is no guarantee that the pages will break where they are supposed to, since each person's browser can be set up differently (margins, fonts, font sizes, etc.). The PDF (Portable Document Format) versions of the lecture notes are optimized for printing. All page breaks should occur correctly. If your web browser has the proper plug-in installed, clicking on the PDF will bring the file into your web browser from which you can then print the notes. If the plug-ins are not installed, your web browser will either attempt to download the PDF files or offer to send you to the Adobe web site to download the plug-ins for your browser. If you choose to download the PDF format lecture notes you will still need the free Adobe Acrobat Reader to view and print the files. This and further information about the browser plug-ins can be obtained by clicking on the icon below. Special Note on Fonts- Some web browsers use a different method to display the Symbol font which I used for creating Greek Characters like - Δ Σ α β etc. If these characters do not show up as Greek characters, your browser has this problem. The alternative is to use a different browser to view the html files or to use the PDF files where all fonts are rendered correctly. Note: Only Files with the Red Asterisk * have been updated for the Spring 2018 Term. Note: Both HTML and PDF files are available from the list below. Note: Only files with an asterisk (*) have been updated for the Spring 2018 Term. Note: This list is not exhaustive, but it contains some important links that will also contain other links to natural disaster information. Times Picayune Series on Hurricanes - "Washing Away"